A ho ho ho horrible year is coming to a close and we’re hoping that the Russians and Trump love their children too. We delayed this week’s publication a day since the best Christmas present we could think of was a day without Trump. Our apologies to our readers in the Commonwealth for ruining Boxing Day. During this holiday time, as you are surrounded by friends and family, take a moment to reflect on what you’ll be fighting for in 2017. Also take a look around to see how bad things can get. Around you may be people who were denied to the right to vote, who were forced into an internment camp, who fought in WWII, or who lived in a segregated society. Also, think about who is not in the United States these holidays: Jews who were denied entry during the Holocaust, Syrian refugees turned away, soldiers who died in Iraq, and refugee kids from El Savador that were sent back to a war zone. Maybe, just maybe, all of us working together can make 2017 better than this year. Good riddance 2016, RIP George Michael, and best thoughts to Carrie Fisher. Each week, I feel like an evil Casey Kasem counting down the greatest fears of the 80s. Last week, it was the fear of a Russian infiltration into the U.S. 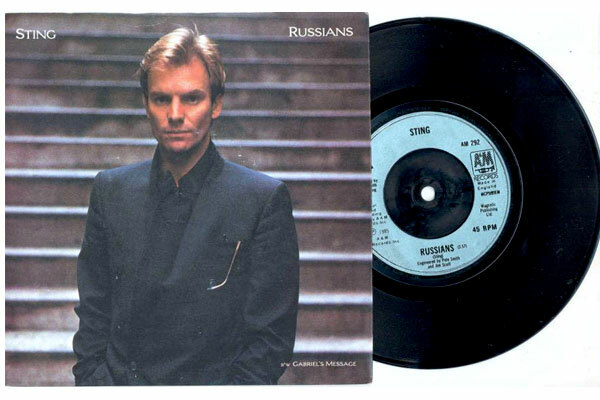 This week’s chart-topper is fear of nuclear war. On the same day, after probably a late-night gabfest that ended with “I’ll totally do it if you do it,” Putin and Trump both stated their support for more nuclear weapons. Putin said it was time to enhance Russia’s nuclear weapons, so a couple of hours later Trump tweeted (because 140 characters is certainly enough to make a nuanced statement on the possibility of the end of the world) that he will “strengthen and expand” US nuclear capability. Trump’s handlers quickly tried to defuse his nuclear expansion bomb by saying he just meant modernize our weapons. Trump was having none of that, so he called Mika (of Mika and Joe on MSNBC’S Morning Joe) the next morning to say “Let it be an arms race.” We know this because Mika told us while sitting in her pajamas in front of a fireplace for Morning Joe’s Christmas episode. Because that’s our world now. US and Russia have a combined 14,300 warheads. The rest of the world combined is estimated to have 1,105 warheads. So I think we’re in okay shape. To make this arms race extra troubling is that Trump hasn’t said who the race is against. The timing of Trump’s and Putin’s announcements may portend that it’s not U.S. vs. Russia this time, but rather U.S. + Russia against others (China, I’m looking in your direction). Trump’s National Security Advisor and former Russia Today (Kremlin-owned news channel) commentator, Michael Flynn met with the leader of Austria’s far-right Freedom Partyleader at Trump Tower. Win your NYE small talk with these fun facts about the Freedom Party: it was founded in 1956 by literal former Nazis and they just signed a cooperation pact with Putin. What do you get for the aspiring authoritarian who has everything? His own bodyguards! Just like all the cool dictators – Hitler had his SS, Napoleon would not go anywhere without his Imperial Guard, and Emperor Palpatine is always surrounded by the Force as well as his Royal Guard – Trump will be bringing his own bodyguards with him to the White House. So rather than having the Secret Service, which is dedicated to protecting the Constitution, around him, he’ll have people loyal only to him. If he announces that he’s starting a “Trump Youth” group next, I’m done. Former Secretary of Labor Robert Reich gives a great explanation of Trump’s steps to diminish the media in this 2 minute video. As Reich explains, “media” comes from “intermediary”; that is, the intermediary between the president and the people who helps cast light on the president’s actions and policies. Trump prefers his operations remain hidden in the dark. Le Resistance had some petit victories this past week, just not the big one, which was that whole Electoral College thing. The Rockettes stood their ground (which isn’t easy on one leg) when told they would be required to perform at the Inauguration. Thanks to their willingness to speak out and public support, each Rockette can decide if she wants to kick off four years of Trump. Public backlash also made Andrea Bocelli change his mind and cancel on the President-elect. On a side note, rumor is that Trump asked Elton John to perform. Thinking that Elton John would say yes might be the most delusional thing Trump has done. Due to public pressure, both Ivanka and the two Trump rapscallions cancelled fundraisers in the past week in which they were basically auctioning off White House access. I can’t blame them for thinking this was okay, since they obviously knew that Trump hammering on the Clinton Foundation during the campaign was BS. A&E cancelled a soon to debut reality show, Generation KKK, as someone realized that maybe what we didn’t need right now was a super racist version of Snookie and The Situation. President Obama is doing something to make the world a little better before he leaves. Last week, he teamed up with Canadian Premier Justin Trudeau to freeze new offshore drilling in the arctic. He also dismantled the National Security Entry-Exit Registration System we mentioned inIssue 4 to make realizing Trump’s dream of a Muslim registry (only a little bit) harder. 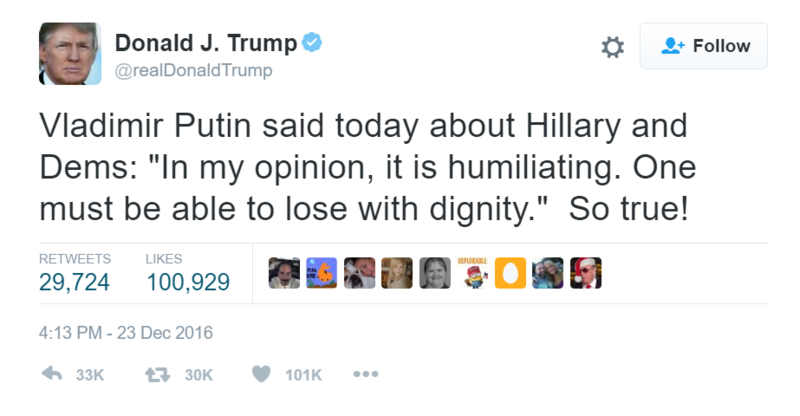 Yep, that’s our incoming president quoting the leader of Russia to attack Americans and our democracy. A Russian president that also happens to kill his opponents and has fake elections. The silence from the GOP on this is beyond belief when you consider how apoplectic (had to wait until late December for that word to come up in my “word of the day” calendar) they were last month over Obama not lambasting Fidel Castro when he died. On the other hand, there is the old proverb, I believe it’s in the book of Matthew, that cutting taxes for the wealthy and eliminating Medicare and Social Security is worth aligning with Russia and increasing the likelihood of a nuclear war. He Didn’t Mean Hire Americans Literally – In the “do what I say, not what I do” department, Trump’sMar-a-Lago Club and the Trump Vineyard have been approved by the Department of Labor, or are seeking approval, to hire foreign workers. These jobs include cooks and waiters, which must be impossible jobs to find qualified Americans for. We’re not anti-foreign workers at The TrumpShaker, just anti-hypocrisy. Repeal and Replace with “Rub Dirt on It” – We got our latest taste of Republican plans for health care this week, when Republican Congressman Bill Huizenga from Michigan recalled fondly how his kid broke his arm one night but they didn’t take him to the hospital until the next day because that was cheaper. With Republican help, maybe every American can soon experience the joy of denying his or her child timely medical care. North Carolina: Actually Last in Democracy – Last issue, I made a fun little joke about North Carolina being last in democracy. It turns out, I was right! The Electoral Integrity Project (EIP) no longer classifies North Carolina as a democracy, comparing it to shining countries upon the hill like Cuba, Sierra Leone, and Iran. The EIP reports that North Carolina is actually last in the world on the integrity of its voting district boundaries, i.e. gerrymandering. Cui Bono – A Trump tweet shaved $1.2 billion off of Lockheed Martin’s market value this week. Former George W. speechwriter, David Frum astutely pointed out this is now a whole new way for Trump’s inner circle to scam us. With advanced knowledge of his tweets, someone could make a fortune shorting stocks. The president who won 5 million more votes in 2012 won’t get to fill Supreme Court vacancy, but the guy who got 2.9 million fewer votes will. Admittedly, I know little about this organization. However, I saw that a friend had posted on Facebook that her friend recently started this to organization to make a difference. I’m impressed. It’s a grassroots effort to match volunteers in safe blue or red districts with those in swing districts to turn them blue. For those of you struggling in your super blue districts to find ways to make political change, this seems like a great organization to plug into. Check out Sister District Project! I Got a Wilbur Ross Rookie Card! Use this holiday week to educate yourself on Trump’s Cabinet of Doom, so you are prepared to call your representatives to tell them to fight these horrific choices. 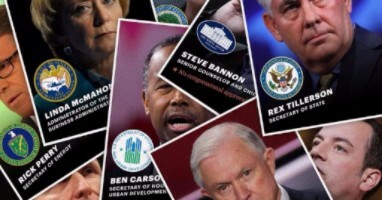 Propublica makes studying for the apocalypse fun with Trump Cabinet trading cards. Collect ‘em all! Previous Post:Vol. 5 – Day 39 P.E. Next Post:Vol. 7 – Day 53 P.E.